مطالعات تجربی زیادی در زمینه ساختار سرمایه انجام شده است، اما شاخه جدیدی از ساختار سرمایه یعنی ساختار سررسید بدهی شرکت هنوز به اندازه کافی مورد تحقیق قرار نگرفته است. ساختار سررسید بدهی شرکت بیانگر ترکیبی از بدهی‌های کوتاه‌مدت و بلندمدت است که شرکت برای دستیابی به ساختار سرمایه مطلوب برمی‌گزیند. هدف از انجام این پژوهش بررسی تأثیر متغیرهای کلان اقتصادی شامل تولید ناخالص داخلی، نرخ تورم و عرضه پول بر ساختار سررسید بدهی شرکت‌های پذیرفته شده در بورس اوراق بهادار تهران است. به منظور آزمون فرضیه‌های پژوهش از تحلیل رگرسیون چند متغیره با استفاده از داده‌های ترکیبی و اطلاعات مالی 92 شرکت نمونه طی دوره زمانی ده ساله (1380-1389) استفاده شده است. برای آزمون فرضیه‌های پژوهش از آزمون‌های F فیشر و t استیودنت استفاده شده است. یافته‌های پژوهش نشان می‌دهد که در سطح کل نمونه بین نرخ تورم و ساختار سررسید بدهی رابطه منفی معنی‌دار وجود دارد. همچنین بین ساختار سررسید بدهی و عرضه پول رابطه منفی و معنی‌دار وجود دارد. علاوه بر این بین ساختار سررسید بدهی با تولید ناخالص داخلی ارتباط مثبت و معنی‌دار وجود دارد. افزون بر این، آزمون فرضیه‌های پژوهش در بین صنایع مختلف به نتایج متنوعی منتهی گردید. بنابراین به شرکت‌ها پیشنهاد می‌شود در دوره‌هایی که نرخ تورم بالا و تغییرات آن بلندمدت است و همچنین عرضه پول زیاد است در ساختار زمانی بدهی‌های خود بدهی کوتاه‌مدت را انتخاب کنند، زیرا هزینه‌های نمایندگی با این انتخاب کاهش خواهد یافت. Numerous empirical studies have focused on aspects of capital structure; however, a new branch of capital structure, debt maturity structure has not been studied enough. Debt maturity structure means the mixture of short term and long term debts that the corporation chooses to achieve an appropriate capital structure. 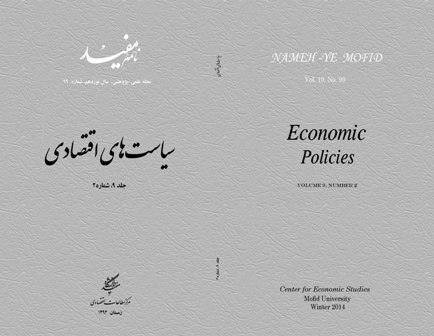 However, there is no study in Iran about debt maturity structure; hence the objective of this research is the investigation about the effect of macroeconomic variables including GDP growth rate, inflation and money supply, on debt maturity structure in companies listed in Tehran Stock Exchange. To examine research hypotheses, multi-variable regression analysis via pool data and financial information of 92 sample companies were utilized, during time period of 2001 to 2010. To test the hypotheses, Fisher F-test and t- student test were applied. The study findings represent the negative correlation between inflation rate and debt maturity structure on the whole sample used in the study. In addition, there is a negative relationship between the debt maturity structure and money supply. Furthermore, there exists a positive relationship between GDP and debt maturity structure. There are also various correlation results in different industries. Therefore, we propose in the periods in which inflation and money supply are high and their changes are long term, the firms should select short term debts on their debt maturity structure; since agency costs will be reduced. باقرزاده، سعید؛ «تبیین الگو ساختار سرمایه شرکت‌های پذیرفته شده در بورس اوراق بهادار تهران»، مجله تحقیقات مالی، 1382، شماره 16. ستایش، محمدحسین؛ کریمی، لیلا؛ کریمی، زهره؛ بررسی رابطه متغیرهای کلان اقتصادی و ساختار سرمایه شرکت های پذیرفته شده در بورس اوراق بهادار تهران، تحقیقات حسابداری و حسابرسی، 1390، شماره 11. شیرین‌بخش، شمس‌اله؛ حسن خوانساری، زهرا؛ کاربرد Eviews در اقتصاد‌سنجی، پژوهشکده امور اقتصادی، چاپ اول، 1384. فهیم‌نژاد، رضا؛ آقایی، محمدعلی؛ «نقش استقراض (اهرم مالی) در سودآوری شرکت‌های پذیرفته شده در بورس اوراق بهادار تهران»، مجله بورس، انتشارات سازمان بورس اوراق بهادار تهران، 1382، شماره 39. کریمی، فرزاد؛ اشرفی، مهدی؛ «بررسیارتباطسازوکارهاینظامراهبریشرکتیوساختارسرمایهدربورساوراق بهادارتهران»، مجله پژوهش‌های حسابداری مالی، 1390، شماره دوم، شماره پیاپی (8). گجراتی، دامودار؛ مبانی اقتصادسنجی، ترجمه حمید ابریشمی، جلد دوم، انتشارات دانشگاه تهران، چاپ دوم، 1378. گوگرچیان، احمد؛ «بررسی عوامل جذب سرمایه‌گذاری مستقیم خارجی در صنایع پتروشیمی ایران به روش داده‌های تابلویی»، فصلنامه پژوهش‌های اقتصادی ایران، 1385، شماره 26. مهرانی، ساسان؛ کاشانی‌پور، محمد؛ رسائیان، امیر؛ «عوامل تعیین‌کننده ساختار سرمایه در ایران»، فصلنامه پژوهش‌نامه اقتصادی، ویژه‌نامه بورس، 1388. نماگرهای اقتصادی، بانک مرکزی جمهوری اسلامی ایران، 1389. نوروش، ایرج؛ عابدی، سجاد؛ «رابطه بین شیوه‌های تأمین مالی و درصد تغییرات هزینه سرمایه (مطالعه موردیشرکت‌های پذیرفته ‌شده در بورس اوراق بهادار تهران(»، مجله دانشکده علوم اداری و اقتصاد دانشگاه اصفهان، 1384، شماره 3. هاشمی، عباس؛ مهرابی، مهدی؛ «شناسایی عوامل مالیاتی مؤثر بر مزیت استفاده از بدهی برای تأمین مالی شرکت‌های پذیرفته شده در بورس اوراق بهادار تهران، بررسی‌های حسابداری و حسابرسی»، 1387، شماره 15. Antoniou, A., Guney, Y. and Paudyal, K; 2002, "Determinants of corporate capital structure: evidence from European countries", Working Paper, University of Durham. Antoniou, A., Y. Guney, and K. Paudyal; 2006, "The determinants of corporate debt maturity structure: evidence from France, Germany and the UK", European Financial Management, 12(2), p.161-94. Barclay, M. J. and Smith, C. W; 1995, "The maturity structure of corporate debt", Journal of Finance 50, P.609-631. Berger, A.N. ; Espinosa-Vega, M.A. ; Frame, W.S. and Miller, N.H; 2005, "Debt Maturity, Risk, and Asymmetric Information", The Journal of Finance, LX (6), December, P.2895-2923. Billett, M. T., T.-H. D. King, and D. C. Mauer; 2007, "Growth opportunities and the choice of leverage, debt maturity, and covenants", The Journal of Finance, 62(2), p. 697-730. Brick, I. E. and Ravid, S. A; 1991, "Interest rate uncertainty and the optimal debt maturity structure", Journal of Financial and Quantitative Analysis 26, P. 63-81. Cai, J., Cheung, Y.L., Goyal., V.K; 1999, "Bank monitoring and the maturity structure of Japanese corporate debt issues", Pacific-Basin Finance Journal 7, p. 229-250. Cai, Kailan, Fairchild, Richard and Yilmaz Guney; 2008, "Debt Maturity Structure of Chinese Companies", Pacific-Basin Finance Journal ,16, p. 268–297. Childs, P.D. Mauer, D.C. and Ott, S.H; 2005, "Interactions of Corporate Financing and Investment Decisions: The Effects of Agency Conflicts", Journal of Financial Economics, 76, P. 667-690. Datta, S., M. Iskandar-Datta, and Raman; 2005, "Managerial stock ownership and the maturity structure of corporate debt", The Journal of Finance, 60(5), p. 2333-2350. Demirguc-Kunt, A., and V. Maksimovic; 1999, "Institutions, financial markets and rm debt maturity", Journal of Financial Economics, 54(3), p. 295-336. Fama, E. F; 1990, "Contract costs and financing decisions", Journal of Business 63, S71-S91. Fan, J. P., S. Titman, and G. J. Twite; 2011, "An international compari- son of capital structure and debt maturity choices", Journal of Financial and Quantitative Analysis, Forthcoming. García-Teruel, P.J. and Martínez Solano, P; 2007, "Short-term Debt in Spanish SMEs", International Small Business Journal, 25 (6), P. 579-602. Guedes, J. and Opler, T; 1996, "The determinants of the maturity of corporate debt issues", Journal of Finance 51, P.1809-1833. Hart, O. and Moore, J; 1995, "Debt and seniority: an analysis of the role of hard claims in constraining management", American Economic Review 85, P. 567-585. Huang, G., & Song, F; 2006, "The determinants of capital structure: Evidence from China", China Economic Review, 17, 14-36. Jun, S.G. and Jen, F.C; 2003, "Trade-off Model of Debt Maturity Structure", Review of Quantitative Finance and Accounting, 20, P. 5-34. Johnson, S. A; 2003, "Debt maturity and the effects of growth opportunities and liquidity risk on leverage", Review of Financial Studies, 16(1), p. 209-236. Kim, C. S., Mauer, D. C and Stohs, M. H; 1995, "Corporate debt maturity policy and investor tax-timing options: theory and evidence", Financial Management 24, P. 33-45. Leland, H. E., and K. B. Toft; 1996, "Optimal capital structure, endogenous bankruptcy, and the term structure of credit spreads", Journal of Finance, 51(3), P. 987-1019. Mahmud, Muhammad, Herani, Gobind M., Rajar, A. W. and Farooqi; 2009, "Economic Factors Influencing Corporate Capital Structure in Three Asian Countries: Evidence fromJapan, Malaysia and Pakistan". http: //mpra.ub.uni-muenchen.de/15003/1/MPRA-Paper-15003.pdf. Magri, S; 2010, "Debt Maturity Choice of Nonpublic Italian Firms", Journal of Money, Credit and Banking, 42 (2-3), March-April, P. 443-463. Mustapha, M.B., Ismail, H., & Badriyah, B.M; 2011, Determinats of Debt Structure: Empirical Evidence from Malaysia, International Conference on Business and Economic Research (2nd Icber 2011) Proceeding, 2523-2540. Ortiz-Molina, H. and Penas, M.F; 2008, "Lending to Small Businesses: The Role of Loan Maturity in Addressing Information Problems", Small Business Economics, 30, P. 361-383. Ozkan, A; 2000, "An empirical analysis of corporate debt maturity structure", European Financial Management 6, P. 197-212. Stohs M H, Mauer D C; 1996, "The determinants of corporate debt maturity structure", Journal of Business. No.69. P.279-312. Wang, Yanhui, Sun, Yexin, & Qingjun Lv; 2010, "Empirical Study on the Debt Maturity Structure Based on the Macroeconomic Variables", International Journal of Business and Management, Vol. 5, No. 12, P.122-135. Zyblock, Myles; 1997, "Corporate Financial Leverage: A Canada-U.S. Comparison, 1961-1996", working paper. available at: http://papers.ssrn.com.,id=104049.